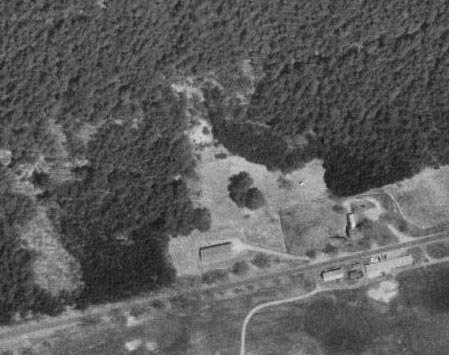 Bretwood Tow was located across the street from the current Bretwood Golf Course on East Surry Road in Keene, NH. When driving from Keene toward Surry on Route 12A East Surry Rd is on the right. Take this road following the sign for Bretwood Gold Course. You will pass the golf course on your left. Just after the club house there is a red farm house and barn, as you drive toward the barn you will notice the bottom of the rope tow. The other day while driving past with a friend I saw the bottom of the rope tow and pulled over to take pictures of it for further exploration. 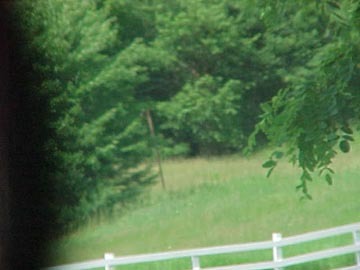 As I was taking pictures from the road a gentleman on a farm tractor pulled up into the yard. 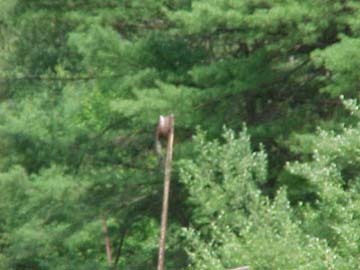 He looked down toward the road at me and I asked him if he knew anything about the rope tow that used to be there. He said, "Know something about it, I built it." I introduced myself and asked him if he had a minute and would like to tell me more. He introduced himself as Ellis Barrett and told me that he had built the tow around 1953. Apparently, when he first built the tow, a State Tramway Inspector drove up one day and said he had come because the rope tow was not registered. Ellis offered to let him inspect it and showed him the safety gates he had put on it at both the bottom and the top, but the inspector said he didn't want to look at it. He told Ellis he would have to register it. Ellis told him it was on his personal property for personal use and he didn't feel he needed to register it. About a week later, Ellis got a subpoena to appear in court because the rope tow wasn't registered. He told me he wrote a letter inviting them to inspect his tow and sent a check, but they never came out to do it, so before his court appearance he cancelled the check. Ellis' argument in court was that he never charged anyone to use the tow and the area was on private property so the people there were his private guests. He told me that he told the court if he had to register his rope tow then everyone who had a tennis court, basketball court or other recreational area in their yard should have to register them too. Ellis won his case. Bretwood Tow at Barrett's Farm Terraserver picture. Tow went up the hill near the barn. The hill has grown in guite a bit now, but part of it is still clear. Ellis allowed anyone who wanted to use the tow to do so and never accepted payment for use of it. He said that people still come up to him today and tell him they learned to ski on his hill. He continued on to tell me that after working the farm all day, he would come over and shovel snow from the sides to cover bare and thin spots. He also told me about the many small children he used to help up the rope tow. During the life of the small area he used two ropes. He used Columbian Hemp Ski Rope. When the first rope wore out from use, he purchased a new, longer rope and extended the tow further up his hill. The rope was about 1800 feet long from end to end which meant that it towed people about 800 feet up the hill. His slope was between 150 and 250 feet wide as it came down the hill. He told me that the hill had about a 30 degree grade. It appeared to have about 100-150 vert. to me. 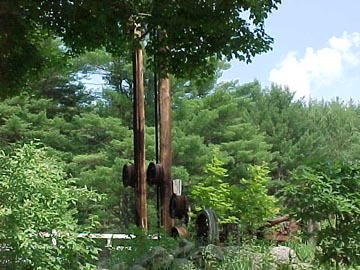 The lift was constructed using telephone poles and tire rims. It was powered by a John Deere Tractor and a Studebaker transmission. 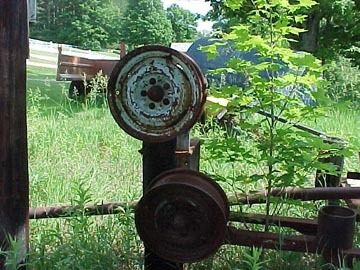 Ellis constructed the drive wheel by hand using small pieces of wood to shape sections of it. 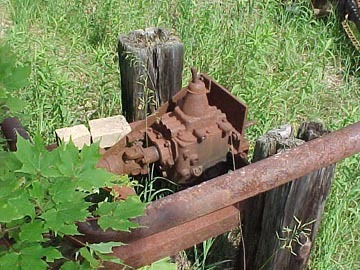 Bottom of the tow from road. Close up of drive wheel. 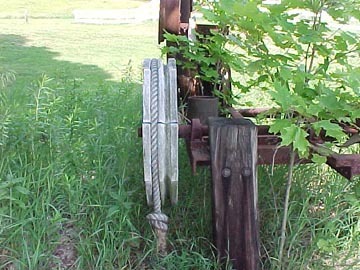 Pulley wheels at the bottom.